A living trust is a legal form designed to safely transfer an individual’s financial assets to designated beneficiaries when the individual has passed away. A living trust, as the name suggests, makes sure that the disbursement of assets do not last for more than a couple of weeks and saves the affected family time and money. Living trusts are also well-known planning devices for estates. Here is a list of Sample Forms that you should go through to get a clear idea. 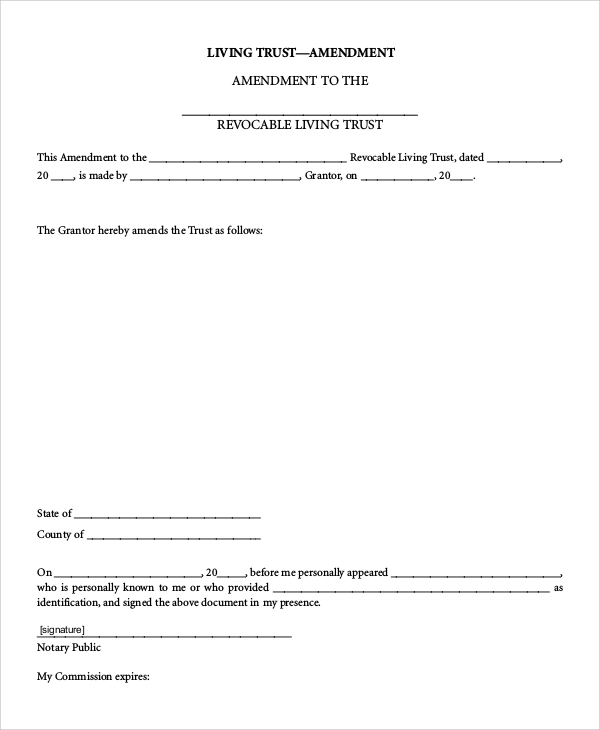 A revocable living trust can be changed, revoked or canceled as per the grantor’s wishes and is fairly easy to draft. It is an effective tool for privacy concerns and avoiding the damages incurred during probation. The advantages of an irrevocable living trust form include reduced estate tax rates and protection of the grantor’s assets because the asset is owned by the trust and it cannot be misused by creditors. 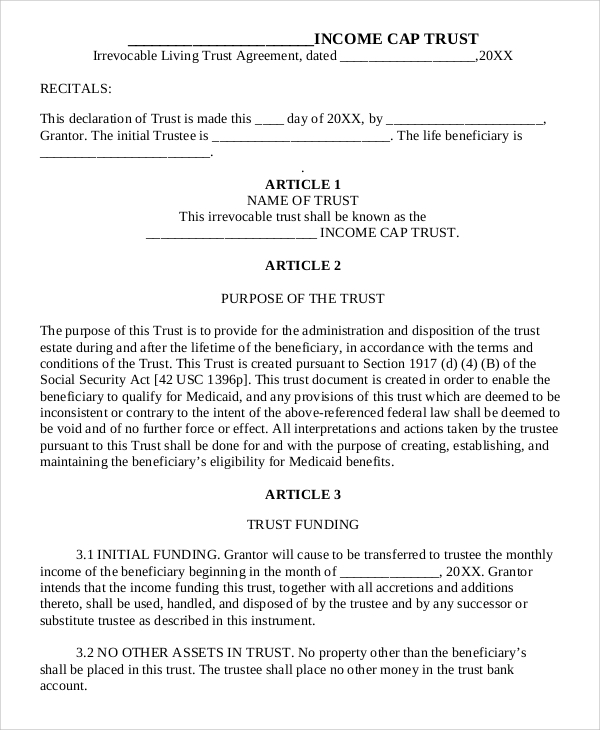 The Trust Amendment Forms allows the grantor to change or add beneficiaries, modify/restrict conditions. For example, the assets received by an individual when they legally come of age. 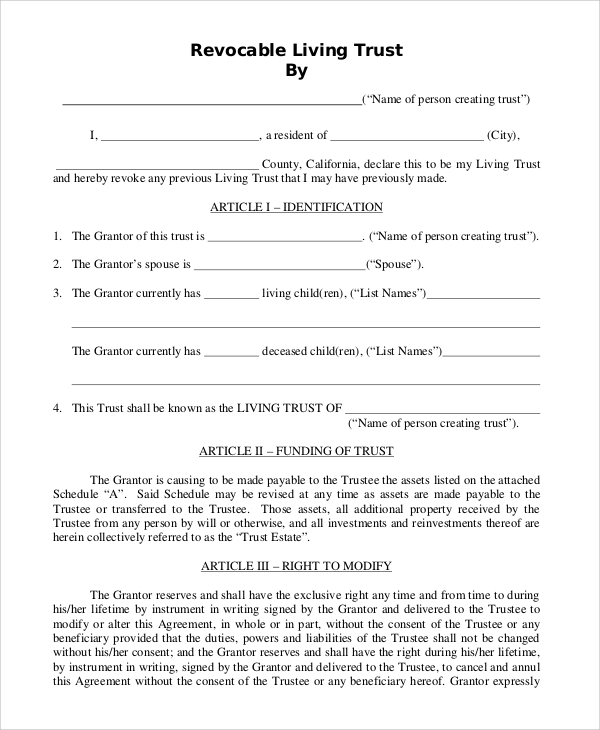 Living trust forms are crucial as far as the welfare of beneficiaries are concerned because that is the reason Grantors draw up living trusts in the first place. It is fairly easy to draft because it can be written without having to hire a lawyer and the beneficiaries of the trust can avoid going through the exceptionally time-consuming process of probate. 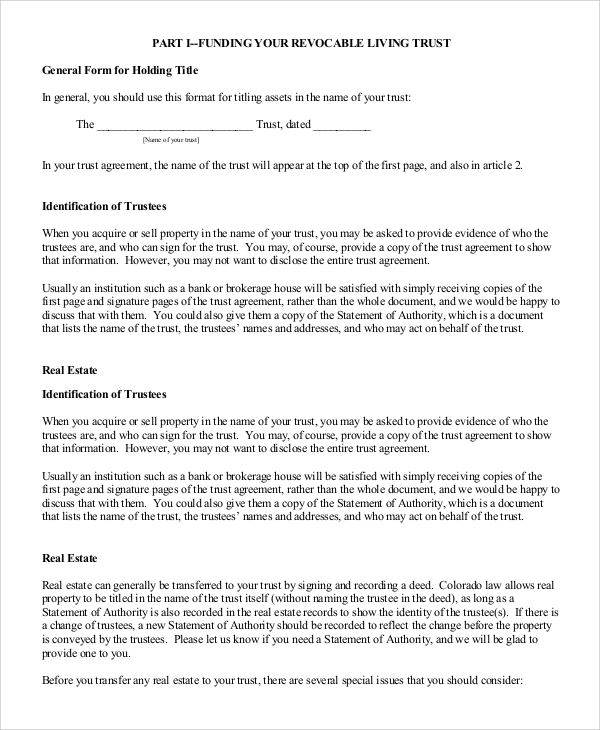 You can also see the Sample Deed of Trust Forms. They are also extremely convenient to make changes to, and unlike wills, Living Trusts are not public for reviewing. A living trust is also transparent of the grantor’s wishes and goes a long way in avoiding family feuds after the death of the grantor. 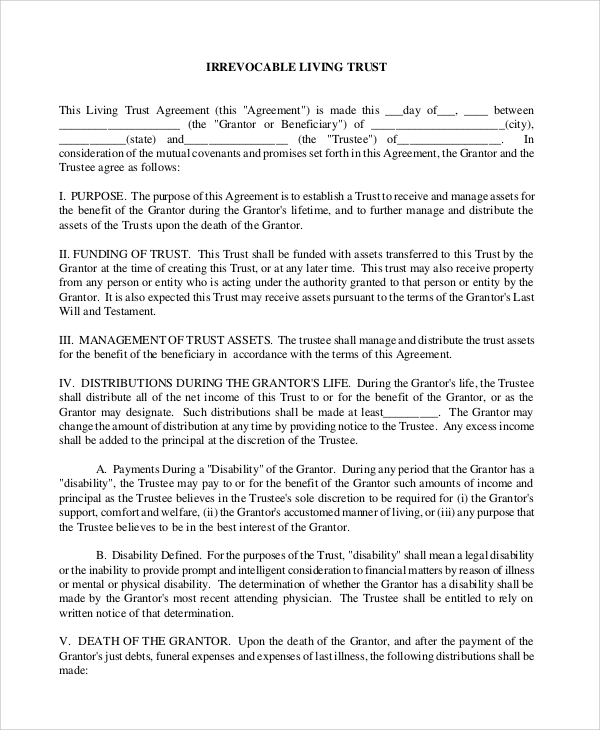 A living trust agreement form declares that the grantor assigns the trustee to be held accountable for all the assets present in the Trust. 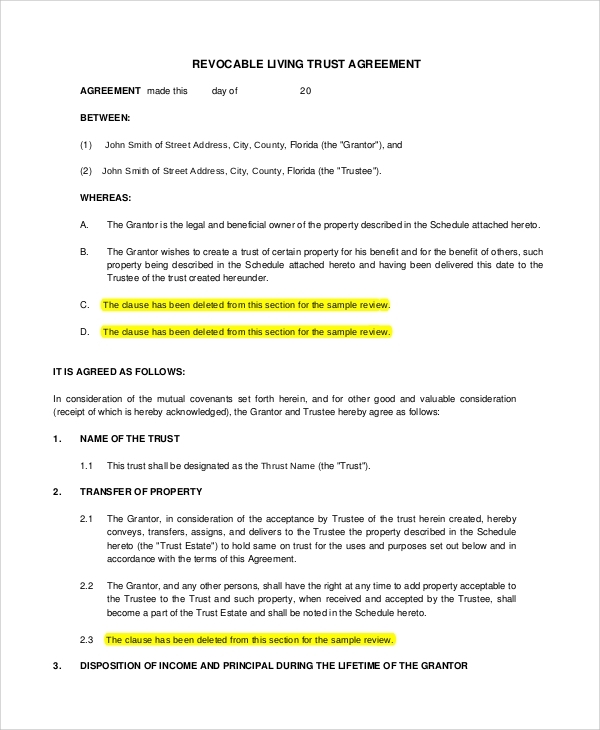 The Grantor and any other person can add to property already available. 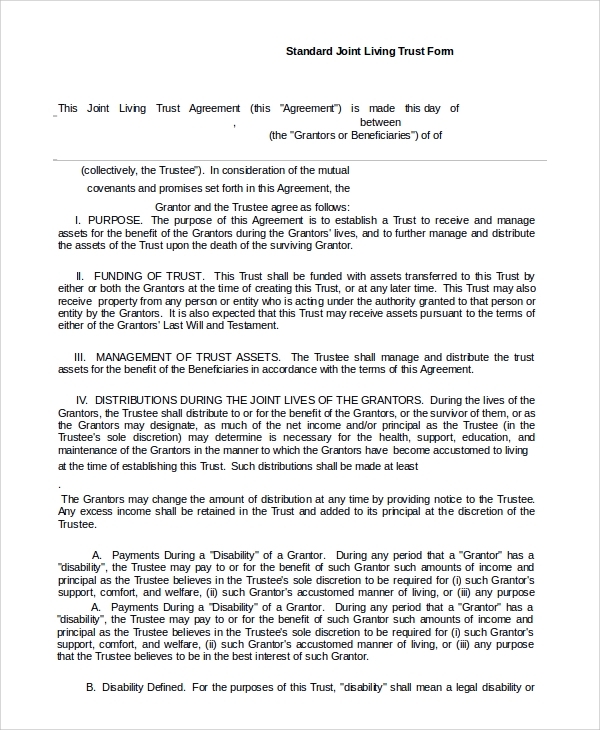 The purpose of the agreement is to form a trust which will receive and manage assets for the grantor while they are alive and also after their death when their assets have to be distributed among the beneficiaries. If you are looking for a safe and smart way to manage your assets, then these samples of Living Trust Forms will go a long way in helping you to arrive at a definite conclusion.These samples are extremely efficient, safe to edit out discrepancies and easy to draft making it the perfect approach without having to look for professional legal counsel, thus saving a lot of time and resources. 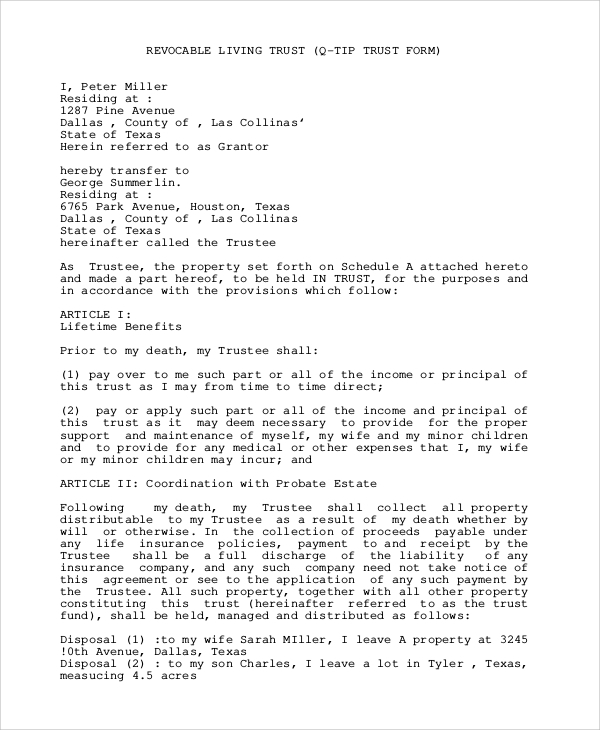 It is also imperative to mention that Living Trusts are legal throughout the United States of America and do not lose value if the grantor or the beneficiaries move from one state to the other. We have a varied range of Sample Will Forms which are easy to use and editable which will enable you to use the samples as per your convenience. These will ensure that your experience with Living Trust forms is beneficial to you and your family and are completely hassle free.